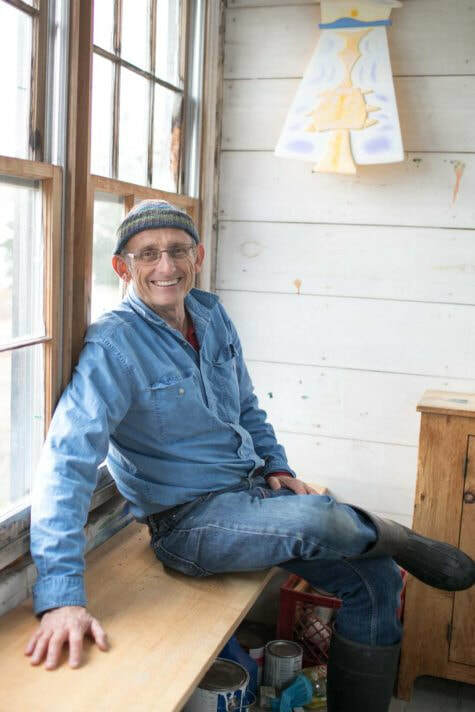 With the eyes of an artist, the words of a poet, and the mind of a scientist, Eric Hopkins has engaged numerous people through his art and with his thoughts about life on this Big Blue Planet. He captures the dynamic forces and rhythms of nature in watercolors, oils, blown glass, mixed media, and photography. His vision focuses on the Big Picture of the natural world, geological and geographical forms, and the exchange of energy between Earth, Water, and Sky. From this intimate study of nature, Eric has developed a keen awareness of light, form, color, and pattern, which is reflected in all of his work. Eric’s paintings and glass are held in many private and public collections, including the Farnsworth Art Museum, Portland Museum of Art, Bates College Museum of Art, University of Southern Maine, Corning Museum of Glass, Wustum Museum of Fine Arts, and the U.S. Department of State Art in Embassies: Bahamas, Mali, Pakistan, Philippines, and the West Indies. He is also represented in the corporate collections of Central Maine Power, L.L. Bean, Johnson Wax, Sanyo Securities, TD Bank, and Idexx Laboratories.